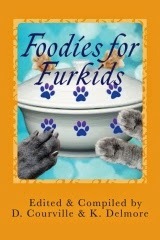 #FoodiesForFurkids Cookbook by @RaphaelGingrBoy @Skeeterthetabby and many more of your pals! A unique cookbook featuring the Anipals of Twitter: chefs de cuisine with their paws in everything, from appetizers to dessert! Profits from sales of this cookbook go towards helping animals in need. If you are in need of assistance please contact Raphael.